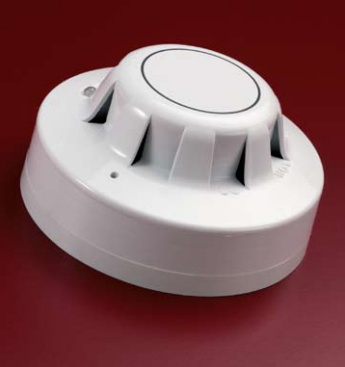 The Apollo Series 65 Optical Smoke Detector detects smoke using a internal pulsing LED and a photo-diode at an obtuse angle. In clear conditions the light from the pulsing LED will not fall on the photo-diode but when smoke enters the chamber smoke particles cause the beam of light from the LED to scatter. The photo-diode then detects the scattered light. Three consecutive sensor activations are required to trigger an alarm state. An alarm state is signalled by increasing the current drawn from the supply from about 40μA to a maximum of 75mA – this is recognised by the control panel and the fire alarm is activated. The inner sensing chamber is moulded as a labyrinth to prevent the penetration of external light sources and there is an insect resistant cover. These elements combine to make this a reliable optical smoke detector for any conventional fire alarm system. Upon entering an alarm state the external LED lights up for easy identification. The moulded self-extinguishing white polycarbonate casing is identical to that of the Series 65 Ionisation Smoke Detector in all but the external LED – on this smoke detector the LED is clear during normal conditions but illuminates red during an alarm whereas the LED on the ionisation smoke detector is coloured red whether it is illuminated or not.